Model of the US main bomber of WWII, modeled in Wings3D, packed for Poser, parts in .obj for other apps. All the usual suspects.....I must say a huge thank you to Tommy at Planes of Fame in Chino for a folder full of photos that really helped with this one. 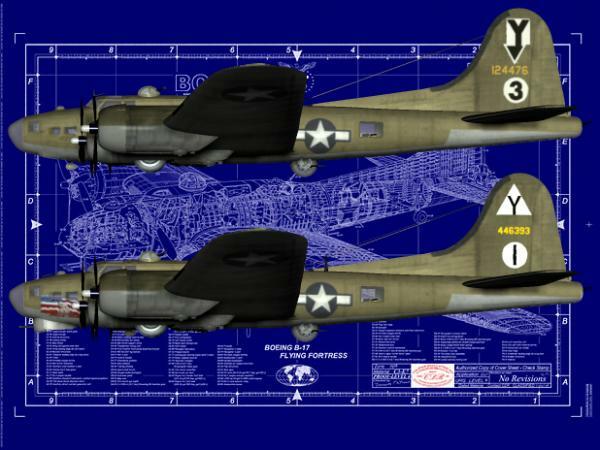 Make B-17F or G, OD and Bare Metal skins with some generic markings, blanks to mark up your own units and a couple of complete paint jobs including 'Sally B / Memphis Belle' based at Duxford. metralha (6 weeks ago) Inappropriate? Thanks a lot for share this beautiful aircraft. I'm working with this machine creating war scenes. Thanks again. Mivan (2 years ago) Inappropriate? My father Lt. George Van Volkenburg was a navigator on a 17 over Europe and the Med. He is buried at the veterans cemetary in Brunswick GA. Thanks for the great model! Zephyr Onze (2 years ago) Inappropriate? When I was young (in the 80's), I was not rich enough to buy the 1/72 model of this plane. Now it's free !! Skelch (4 years ago) Inappropriate? One of my favorite quotes from a German fighter on this plane. He said "attacking a B17 was like making love to a porcupine on fire" Great Model! Amazing work, thank you for sharing! Thank you so much for this workhorse of the mighty 8th Airforce. dw14832 (4 years ago) Inappropriate? Great Job ! Another masterpiece. BardCoennius (4 years ago) Inappropriate? Mig (4 years ago) Inappropriate? Awesome work! Thank you for sharing. MacMullin (4 years ago) Inappropriate? Well Neil, by now I am sure every one can see the vertices and points running under your skin like veins. Great B17! Dlm8hn (4 years ago) Inappropriate? Thalek (4 years ago) Inappropriate? Planes of Fame is a wonderful place! I need to get back there again. agent0013 (4 years ago) Inappropriate? This is one I have been hoping you would do! Excellent job from the look of the promos! Thank you! Bunyip02 (4 years ago) Inappropriate? Production line 3D models, awesome work, many thank-you's as always. Please keep them coming !!!!!!! Tenement (4 years ago) Inappropriate? mac2010 (4 years ago) Inappropriate? Superb work Neil, Another masterpiece, Looks fantastic and the textures are spot on, Cheers!!! !